I’ve recently started to eat oat bran for breakfast. Mike introduced it to me. It was good, so I started to make it myself. At first I didn’t think much about it—it’s just oatmeal, right?—but after checking into it’s nutritional value, I’m pretty amused. Oat bran is the discarded outer husk of oats—that is what’s used for oatmeal. It’s most often been discarded, or reserved for livestock feed. The problem with this is that the bulk of dietary fiber in oats is in the bran. In a 1/3 cup portion, it has 7 grams of fiber (28% daily value). It’s also a good source of protein—also 7 grams. 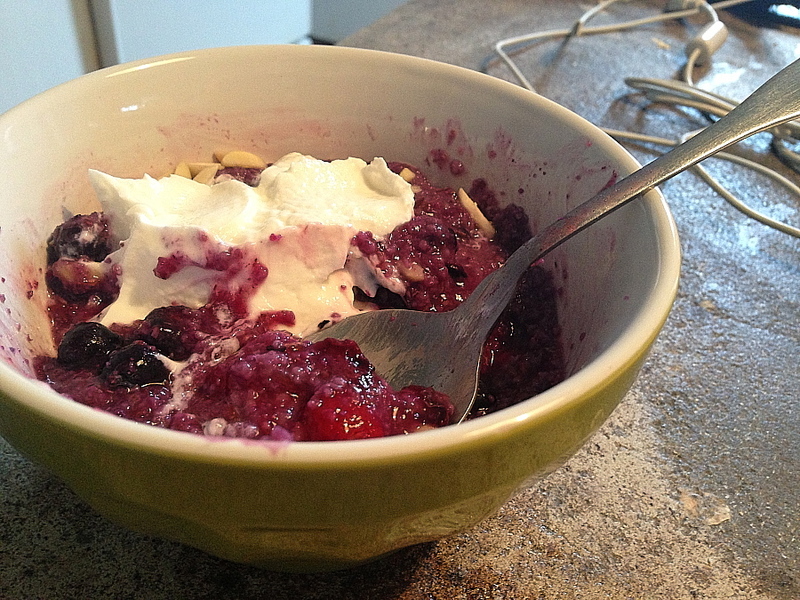 I prepare it with 1 cup frozen blueberries (4 grams fiber) and a half-cup of Greek yogurt ( 11 grams protein). In total it’s about 285 calories.